It seems one of the toughest hurdles in organizing watershed restoration efforts is identifying the goals and types of projects that need to be done. Many initiatives seem to get bogged down by the sheer volume of issues and differing perspectives, making it hard to organize and prioritize goals and objectives. 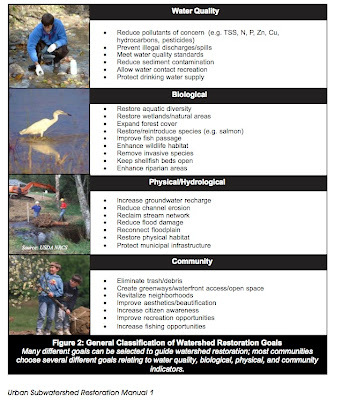 Here are a couple of excepts from Manual 1, An Integrated Framework to Restore Small Urban Watersheds, which examines the basic concepts and techniques of urban watershed restoration, and sets forth the overall framework used to evaluate subwatershed restoration potential. This is a good starting point for anyone interested in working to protect and restore the ecological integrity of their watershed.